BA (Hons) Dance Performance will offer an intensive dance training programme that focusses on contemporary techniques but that is supported by classes in classical ballet, contact improvisation, somatic practices and dance styles from wider cultural contexts. With the emphasis on dance performance you will be developing both your technical and expressive skills through regular performance opportunities in the Dance Studio Theatre as well as outside venues. Working with a range of experienced dance staff, visiting choreographers and dance practitioners the aim is to prepare you for a career within the dance profession. 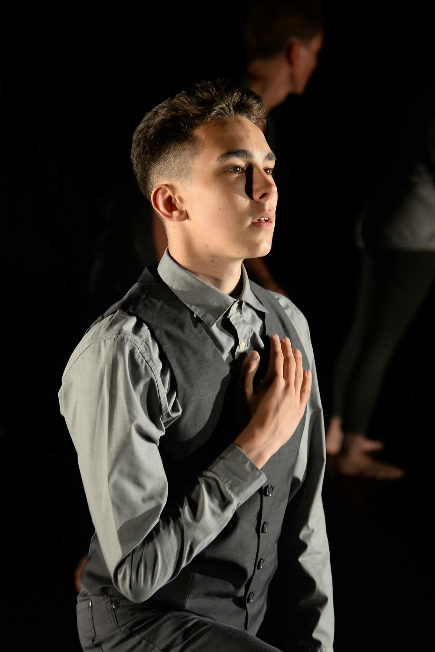 There is the opportunity to undertake a work placement as well as develop your skills in communication and teaching of repertory and technical dance material to be delivered to gain valuable communication and dance teaching experience. GCSEs: English language and mathematics. 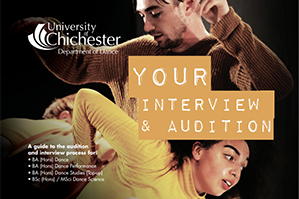 Interview: Applicants will be required to participate in a dance audition (two and half hour practical) designed to assess your potential to respond both technically and expressively. Evidence of interest in and training / experience in dance is explored in a paired interview. Alumni receive a 15% discount on postgraduate courses at Chichester. Postgraduate study options at Chichester include PGCE and Masters. This dance performance route is focussed on giving you the knowledge, skills and understanding to prepare you to enter the dance profession and audition as a performer/choreographer or independent dance artist. Whether you want to set up your own dance company or join an established company, having gained the range of experiences working with professional choreographers and expert tutors will enhance your employment opportunities. "During my year at University of Chichester I felt incredibly supported and mentored for the technical, artistic, athletic and academic side of my growth. I had the chance to improve my dance technique thanks to the variety of classes and teachers we were provided. I felt stimulated and confident to start my professional career after leaving the institution." The Dance Performance course is a great way to widen your dance knowledge and improve your technical abilities. The course is demanding; physically and mentally but in your lessons you learn to channel your energy to make sure you can perform the same at the beginning and the end of each day. The teachers are really supportive and understand that everyone has different strengths. Before coming to Chichester I had never done ballet before; I was worried that I would struggle and not be able to keep up with everyone else but the teachers have really helped me and pushed me the right amount so that I feel more confident and comfortable in class. Eight technical dance classes a week will enable you to hone your technical dance practice. Choreography is an essential part of training to be a dancer and working to develop your own compositional voice through theatre based work as well as site specific and screen dance will be explored. Improvisation and somatic approaches will enable you to develop as individual performance approach. Having an understanding of the business and management, and necessary arts administration is essential for setting yourself up as a freelance dance artist, community dance practitioner, being self employed or gaining work in an established dance company. Our dance facilities include four superb dance studios, a fully-equipped 250-seat theatre and a 110-seat studio theatre. In addition, there is a newly refurbished large gymnasium space together with two new sprung-floor spaces in the new academic building. Our students will use the facilities within our dance technical team to enhance their understanding of scenography, sound and cameras, and the editing suites to support their choreography and creative practice situated in the Learning and Information Zone of the library. For more information, please visit our International English Studies page. If you have an IELTS score under 5.5 you can still begin a 3-year degree programme with us. In this case we provide a 5 or 10 week intensive Presessional Programme in English language and academic skills. For the 10 week Programme you’ll need IELTS 4.5, and IELTS 5.0 for the 5 week Programme. See our Presessional page for further details. You’ll build your subject knowledge and practical experience through core and optional teaching modules appropriate to the breadth of the curriculum. Your learning encompasses development of dance knowledge and skills intrinsic to dance practice. Learning is supported by theoretical inquiry and debate, to provide you with the ability to contextualise your learning within academic frameworks. Standard module: A single module scheduled over one semester (15 credits normally) examples Popular Dance and Introduction to Improvisation and Composition. Double module: A double module is spread over two semesters (30 credits normally) examples: Dance Portfolio and Dance Placement. Long thin module: A standard module can be spread over two semesters (15 credits normally) example: Dance Technique. Summer module: Summer study, condensed into a two week period (15 credits normally) example: Interdisciplinary Arts Project and Performance and Place. Module strand (Level 6): This is a double module, either 2 x 15 credits or 30 credits, designed to allow for in depth subject study. For example: Dance Movement Psychotherapy 1, Dance Movement Psychotherapy 2, Teaching Dance Technique, Teaching Dance and Creative Practice. Theory modules allow you to begin to develop research skills necessary for degree study. Teaching is delivered through illustrated lectures and small group seminars, linking dance theory to practice. Daily practical classes enable you to engage in healthy, safe dance practice, through floor, ballet barre, centre work, traveling exercises and improvisational exercises, designed to develop technique skills needed for university dance study. Learning and teaching in dance technique allows you to develop movement memory through repetition of set sequences, timing and musicality, use of space, and experiential learning through improvisational techniques. To extend practice, you will be involved in the ongoing rehearsal and choreography of peers. You will be interviewed in pairs or threes; you will be asked about your experience of, and interest in, dance to date. We also want to know why you wish to study Dance Performance at university. You will take part in a contemporary dance technique class and a creative task-based practical class. We are looking for your potential for contemporary dance training (technique and creative practice) and how you work with others on practical tasks. You will also take a short ballet barre and perform a 1 minute pre-prepared solo in a contemporary dance style. All applicants send a short written task prior to interview. For more information about timings, what to wear, etc - download the Dance audition booklet.